The people who had parked empty trailers at Cottonwood Monday and Tuesday showed up Wednesday night. Our park was beyond capacity — many sites had more than one trailer or RV on them. We were going to roll north on Independence Day anyway, and this made it easier. Cottonwood and the Salmon River are wonderful, but you don’t want to be in one of those 14 campsites with 150 other people sharing that little space. We landed a hundred miles north at Indian Trees, a Forest Service campground near Sula, Montana. 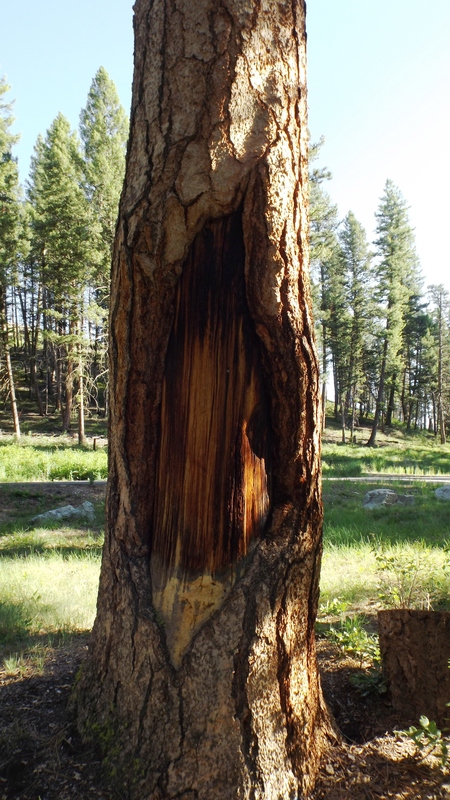 The name came from the native American practice of skinning bark off of Ponderosa pines to munch the sweet cambium layer beneath the bark and above the wood. “Brave was the man who first ate an oyster” and equally gutsy was the first brave who ate pine bark. I tend to be an adventurous eater, but I can’t see the appeal of pine bark. I might think otherwise if somebody hadn’t invented Snickers or ice cream, but somehow I don’t think so. The trees still bear the scars 125 years later. 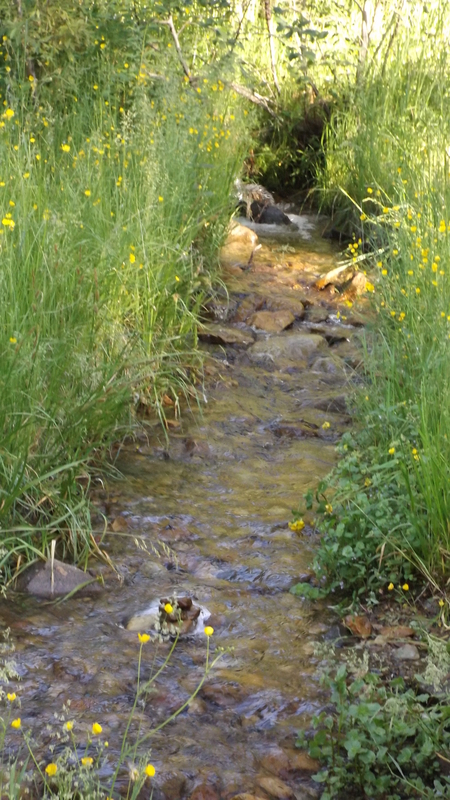 There is a cold, spring-fed stream running through the campground. We cooled Pink off in it, and it cleansed my 2003 LSU National Championship hat of most its sweat stains and some of the ink that came off that dang leaky pen. This campground’s only negative is half a dozen species of biting fly. Kat noticed a horsefly buzz off and then saw blood dripping from her knee: the time had come to get out the old fly-flap and go nukular with Raid. This will be the first July 4th in memory when we have no plans for cooking, partying, or anything other than to move closer to Glacier National Park. We didn’t barbecue because we didn’t have the 20 pounds of charcoal this camp’s grill would need to cook any kind of meat. We cooked some Western Family Orange Flavored Chicken for dinner, and patriotic or not, it was delicious. Speaking of patriotic, a lot of people were flying The Grand Old Flag on this day. We saw hundreds of them. The best one was planted 400 feet up on the crest of a butte overlooking blue highway 93. All but the very top of this little mountain was in shade this morning, but the nine o’clock sun lit up that flag like a spotlight. It was enough to make me crave the piccolo solo in the Boston Pops version of “Stars and Stripes Forever”.